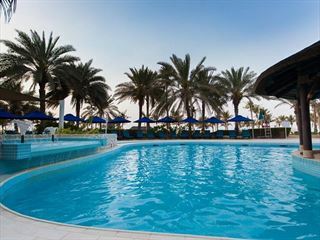 One of two hotels in JA The Resort, JA Palm Tree Court offers luxury living close by to downtown Dubai. 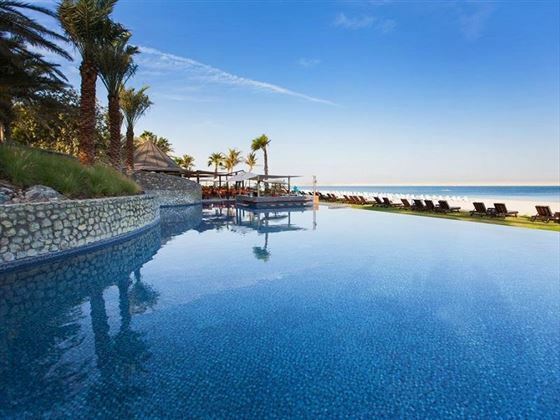 Boasting a pristine 800 metre private beachfront, two stunning pools and nine-hole pitch and putt course, this is a hotel that evokes a cool al fresco lifestyle. As an all-suite hotel, every accommodation option here is opulent and spacious, with stunning views of the lush gardens, the sparkling beach, or one of the pools. Many accommodate a large family, and those above the leading Garden View Junior Suites boast a scenic terrace. Divine gourmet dining is a huge part of the experience at JA Palm Tree Court. Delight the senses with succulent seafood at DiVAZ - the unique floating restaurant, enjoy Italian favourites at La Traviata, or tempt even the fussiest of eaters at La Fontana’s international buffet. Wash it down with a cocktail from the White Orchid Lounge, and you’ve got yourself a delicious holiday. This is a fabulous option for families, or even couples who fancy indulging in a few activities in between soaking up the sun on the beachfront. 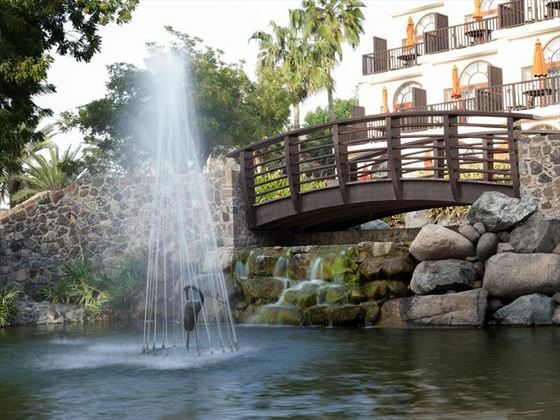 Enjoy an array of thrilling water sports, try an afternoon of clay pigeon shooting, or take the complimentary shuttle bus to Aquaventure Water Park. There’s even two children’s swimming pools, the CoolZone Kid’s Club for kids ages 4-12 years, and a Chillzone for teens to escape their parents and make new friends. 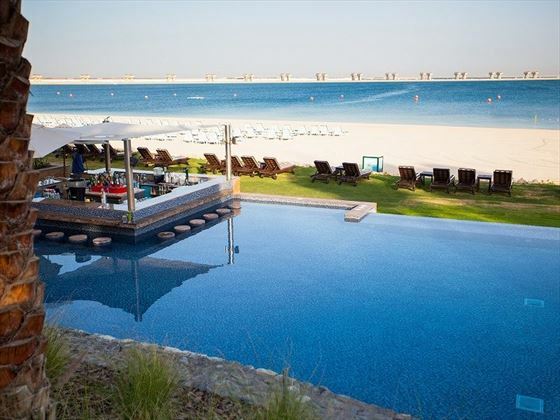 With the resort's All-Inclusive package, you'll have all you need to make this the perfect Dubai getaway. With complimentary watersports - including kayaking and dinghy sailing - as well as access to the fun kid's club, you'll be guaranteed to have a fun-filled, luxurious stay. The resort's sister property JA Beach Hotel is an excellent spot for families too, offering a great amount of delicious restaurants and fun activities. JA Palm Tree Court is situated within JA The Resort. 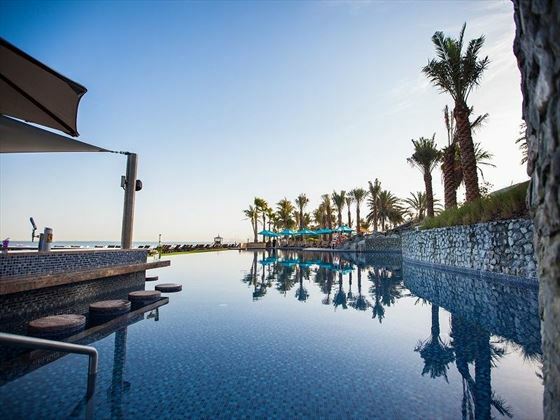 Often titled 'Dubai's only true resort', JA The Resort is made up of two hotels; JA Palm Tree Court and JA Beach Hotel. Set in 128 acres of stunning grounds, these two hotels combine exceptional accommodation with unrivalled leisure and sporting facilities. 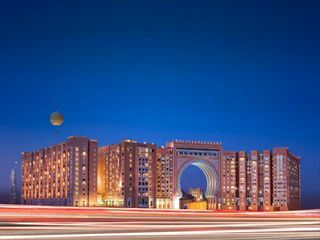 JA The Resort is just 40 minutes from the malls and landmarks of downtown Dubai, 10 minutes drive from Dubai Parks & Resorts, 25 minutes from Dubai Marina and a mere 40 steps from the beach, with views of the Arabian Gulf featured from every single suite. Dubai International Airport is a 45 minute drive away. 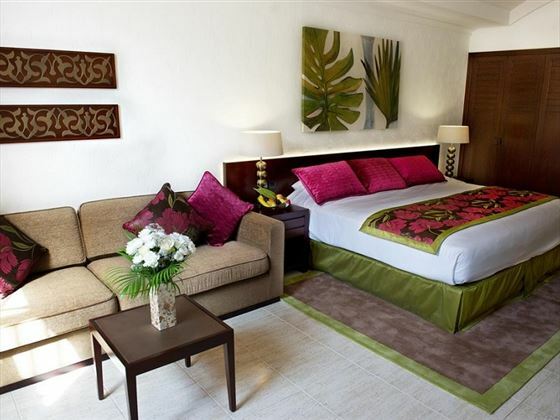 Garden View Junior Suites – are located close to the beach and the pool, have king-size or twin beds, a lounge area with sofa bed and interconnecting room options. Junior Suites are suitable for two adults, one infant and two children (under 16 years of age) or three adults. Garden Terrace Junior Suites– have a fully-furnished garden terrace and are the same size and suitability as Junior Suites. Sea View Junior Suites – are much closer to the beach, have a fully-furnished balcony and are the same size and suitability as the other Junior Suites. Beachfront Terrace Junior Suites – are right on the beach within a garden setting, have a fully-furnished terrace area and are the same size and suitability as mentioned above. Sea View One Bedroom Suites – are double the size of Junior Suites, have two large bathrooms, a separate dining/living area, a master bedroom, easy beach access and the same suitability as Junior Suites. Beachfront Residence One Bedroom Suite - Larger villas on the shore front with an extra bathroom and a separate living area. Great for famlies. 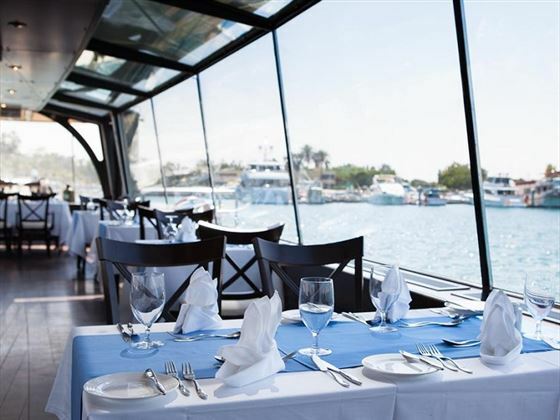 Captain's – lunch and dinner on the beach at this themed bar/restaurant. DiVAZ – delicious seafood delights served upon a unique floating restaurant. 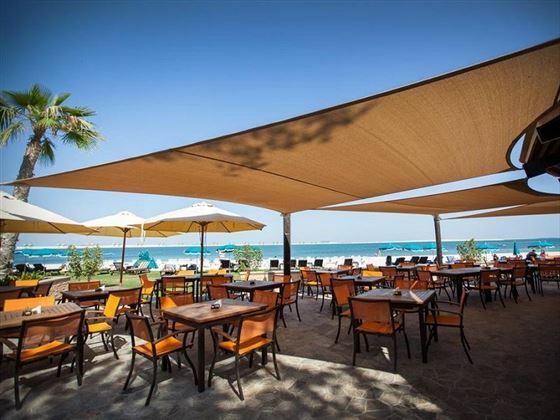 Ibn Majed Restaurant – open for buffet breakfasts and dinners with an international flavour. La Fontana – all-day themed buffet dining with dishes from around the world. La Traviata – spend an evening enjoying the very best of Italy. 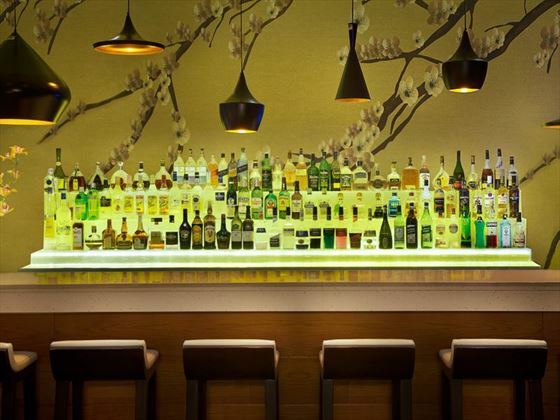 Mushref Bar – live entertainment, cocktails and sundowners. 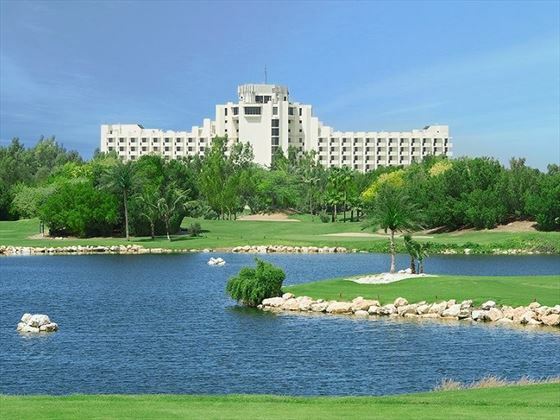 The Oasis – snacks, drinks and refreshments after a hard day on the golf course. Palmito – cocktails, snacks and juices at the pool. Shooters – Tex Mex and steaks at the local shooting club. Sports Café – gastro-pub ambience with food and drink overlooking the marina. White Orchid Lounge – lively cocktail bar with evening entertainment. 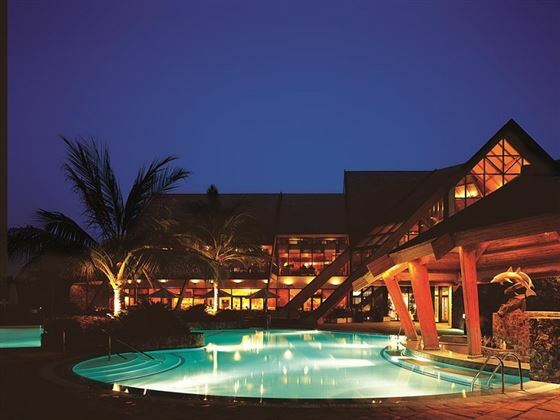 White Orchid Restaurant – sushi bar, teppanyaki tables and Asian favourites served as the sun sets. Huge spa with over 40 treatments for a wide range of well-being therapies and massages. 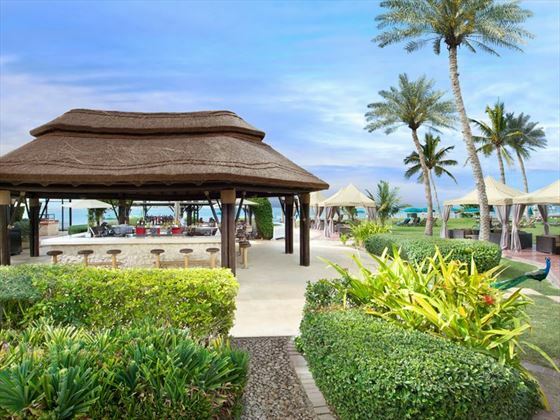 Dubai Parks & Resorts is a 10 minute drive from JA Beach, free shuttle is provided. Offers fun supervised activities and games for children aged between 4 and 12 years old. Open daily from 10am to 7:30pm. For teens aged between 13 and 17, open Wednesday to Saturday 11am to 8pm. Free-flow beverages – including soft drinks, international branded wine, beer, spirits and cocktails during meals, without meals, around the pool and in bars. Lunch, Dinner & Snacks are available on a full dine-around basis at 16 resort restaurants and bars (buffet or à la carte). The holy month of Ramadan will be celebrated in the late summer 05 May 19 - 04 June 2019. During Ramadan, Muslims all over the world abstain from food, drink, and other physical needs during daylight hours. Eid Al Adha falls between sunset on 11th-15th August 2019 and starts with a 24 hour dry day followed by a 3 day celebration. One green fee (9 holes excluding clubs and golf caddie rental), per adult per stay. 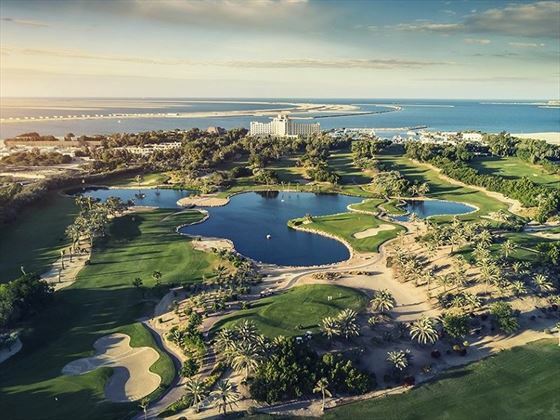 The resort course is open for play to guests with official golf handicaps: men min 28, ladies min 36 and golfers with official playing certificates. Complimentary airport transfer with saloon car from and to Dubai International Airport. (max. occupancy in the car 3 adults incl. luggage).